A specialist of 18th century history, the author attempts to define an event in the writing of history. A fragment of perceived reality, the event presents a relational structure. It belongs to the order of disorder, heterogeneity, and irregularity. Farge insists on the opposition between major and minor events, on the difference between facts, the statements made about them, and their inclusion in historical narration. In the wake of Foucault’s notion of discourse, she wishes to undo the evidence of the event and questions its inscription. Spoken words are themselves events. Memory is not history but witnesses have their own stories to tell. Khaled Kelkal s words and death help demonstrate how historians must analyze the words of others. The last part of the essay is a tribute to Foucault’s notion of the dispersal of origin. In sum, historians should make the event talk while remaining surprised by it. Spécialiste de l’histoire du XVIIIe siècle, l’auteur essaie de définir l’événement dans l’écriture de l’histoire. Fragment de réalité perçue, l’événement présente une structure de mise en relation. Il est de l’ordre du désordre, de l’hétérogène, de l’irrégulier. Farge insiste sur l’opposition entre macro et micro-événements, sur la différence entre les faits, les propos que l’on tient sur eux, et leur inclusion dans le récit de l’histoire. S’appuyant sur la notion de discours (Foucault), elle souhaite défaire l’évidence de l’événement et interroge son inscription. Les paroles sont des événements. La mémoire n’est pas l’histoire, mais les témoins doivent raconter leurs histoires. La mort et les paroles de Khaleb Kelkal aident à démontrer que l’historien a pour tâche d’analyser les mots d’autrui. La dernière partie est un hommage à la notion foucaldienne de dispersion de l’origine. En somme, faire parler l’événement tout en restant surpris par lui. To seize upon the irregular existence that comes to light in what is being done, what is being told. 1An event that occurs is a moment, a fragment of perceived reality that has no other unity but that of the name it is given. Its occurrence in time is immediately shared by those who receive it, see it, hear and tell about it, and hold it in their memory. An event constructs and is constructed; it is at once a piece of time and action broken into pieces, shared, as well as discussed: if historians wish to explain an event, they must work through the shreds of its existence. They are confronted with a lack of order when faced with the event that is found or related. Indeed, its structure is, in itself, already relational, when it is perceived through texts, testimonies or images. This structure is not a given, nor is it a photographic image; the way in which it happens, how it is transmitted, offered, then spoken and projected into the future, all these are part of its existence and disseminate around it an infinity of meanings that are not easily located. 2Thus, an event is defined by disorder and by a shattering of perceptions and meaning: from that moment on historians find themselves faced with heterogeneity, not homogeneity. 3When examining French 18th century archives, perceiving an event is very ordinary—the archives themselves offer an overabundance of events, since one goes from one to the next while studying one manuscript after another. All this in the midst of a pleasant mess, where one can discover side by side what are classically regarded as major events—rebellions, famines, notorious crimes, accidents, etc.—which henceforth organize the course of history as it is decided in textbooks, along with myriad colorful and distinct facts all, of which are signifying but often insignificant, and which end up outlining light and shadow effects on which to reflect. This would be the “grain of days” (Michel Foucault) that spreads generously throughout the opaque and attractive manna of legal documents. 4The body of interrogations and testimonies—more intriguing and more difficult to analyze—is also available for historical reading. In this case, the words, the fragments of assertions or denials, and the commentaries organize an event: conducted by the police, they often exceed the order imposed, extend beyond common sense, divert the obvious, and introduce into the course of history a multiplicity of appearances of the particular. 5Thus, there are facts, both minor and major, and the noises they produce from outside history, from languages/subjects that name and tell, “the obstinate murmur of a language that would speak on its own” while addressing others. These words and discourses make up precise moments; they can be considered as so many events, in that the enunciation of each is inscribed in its own modes of belonging and of being in relation, and in assertions that exclude others and open up particular paths. These words expressed in history—all-too-rare—shape a precise site; they very often create a rift that separates the discourse that activates the political from those everyday words that usually express the singularity of being and of suffering. This rift should not be integrated into the historical narrative but rather understood as something that bends rhetorical and conceptual forms, and until this is done, there will be no history worth trusting. 6Facts and the statements about them are two different materials that each require consideration of their inclusion into the narrative. 7The historians’ occupation and the reading codes imposed onto their documentation lead them to fix the measure and the time, as well as the periodizations composed, they say, of both quiet and troubled times, and of moments of latency followed by crisis. Historians establish a chronology that creates its own principles of causality and consequence. History’s long skyline is an extended lineage of events coming one after the other—at various levels admittedly—but always noticed either because of the rupture they impose on time, or through the obviousness of their presence, which is continuous with what happened before. These events are read in a broken or continuous temporality, which envelops and explains them. 8Historians love events: they appreciate them as much as they worry about “the silence of sources”; in general, they look for (and therefore find) the event that stands out and becomes signifying from the perspective of their own working hypotheses. Thereafter, an events—or events—hold the thread of the narration, form a tangible unevenness that becomes proof and around which historians establish meaning, a chronology, and advents. Because historians welcome an event they have flushed out from archives, they organize their narration around it, and include it in their approach as if justifying what they are trying to demonstrate. Once discovered, an event often acts as an additional force to legitimize their discourse. Here lies the perverse paradox of an event’s presence in historical discourse: progressing from one justifying event to another as if on a game board, historians may at times forget that, abstracted from sources, an event is first selected, a process that serves a larger discursive and demonstrative thesis; and in this way, it is homogenized when narrated. Absorbed by “the cooking of history” (Michel Foucault), an event then takes on an obvious and ‘repeated’ place in historians discourse: they do not easily question why the event was chosen, and suppress the fact that, when choosing one event, historians have put others aside. A sort of amnesia can thus be constructed from a ‘reliable source’. 10Sometimes then, an event is named only because it fits with others that are like it, or is representative of a more or less similar series. Described this way, put forward, elevated not because of its potential singularity but to be assimilated with others, understood among others, trapped inside compact and similar series, an event can lose its autonomy, its unique place, and its uniqueness. Sometimes an event is perceptible only through the so-called anecdotic forms of its appearance and its disappearance. 11There exist more elaborated forms of analysis of an event in which it can become a way to observe the social, i.e. the way to understand all the relations that irrigate a social group, a village, a neighborhood, or even a State. The micro-history of Italian tradition has established this discipline brilliantly. Theorizing on this manner of writing history in the preface to Giovanni Levi’s book entitled Le Pouvoir au village, histoire d’un exorciste dans le Piémont du XXVIIe siècle, Jacques Revel wrote: “Choosing the individual (a micro-event) is not thought as contradictory with the social: it allows for a different approach, and, above all, it must enable the historian to understand, through a particular destiny—that of a man, a community, or a specific work—the complex network of relations, the multiplicity of spaces and times in which it is inscribed”(Revel, 1989). This view makes it possible to displace the questionnaire, and to renew what is possible. At the same time, using Revel’s word, this choice ‘inscribes’ the singular within the multiplicity of spaces, inside the complexity of the social. 12This way of inscribing an event leads, however, to a problem. What kind of inscription is it? If to be inscribed means to merge, it is impossible not to understand that each micro-event has its own way of entering in the company—or not—of all the facts around it. The “inscription” itself is a historical object, because some facts may be obviously inscribed, but others do so through deduction or by breaking from the past, or even by merging transversally and anomically with other events. The use of ‘inscription’ does not solve all the problems of interpretation as this is a question and should not simply be accepted, and we must, in each case, ask what is the possible autonomy of the “micro-event in question”, what fragment of reality it defines or accomplishes when it takes place, to which “succession of random facts” it is linked. How does the event play out and what might it instantaneously exclude that will not take place but might otherwise have happened? The place, the ways, the conditions of the inscription of an event in the social fabric make up its indomitable singularity, that which makes of its appearance not something obvious but an interrogation, and that which builds its definite difference with another and must therefore be analyzed as such. One of Michel Foucault’s sentences can be used here to characterize this questioning: what is this irregular existence which comes to light in what is said, in what happens? 13Indeed, the existence of a being, of an event, of a specific work or a word is, by definition, irregular. The historians’ role is to recognize its course by accepting to shake up their ways of reasoning, to let irregularity itself create a field of analysis and appreciation. This could be possible through the explicit tension of their narrative, which is solely capable of reconstructing the accidental and the rupture, of enabling one to perceive that conflicts, mismatches, possibly even errors, uncertainties and disruptions always organize the origin of an event, its memorization, more so even than its future reading and expression. 14“What about the word,” writes Michel Foucault. “I mean the tenuous event that happened at just one point in time and no other?” (Foucault, 1994, 424). Foucault’s sentence is ever-present in my reasoning. My examination of legal archives and of documents, as well as Foucault’s theoretical reflection on the order and functions of the discourse, mixed with a reflection I began with some historians of the present on testimonies and on memory, have led me today to state the following: the derisory, barely audible words, those of little value (but what are words of much value? ), the formulated answer, the undertaken narration are, for me, all events. Just like battles, riots, diplomatic treaties, “like” them and differently also of course. The first preface to L’Histoire de la folie (Foucault, 1976), “La vie des hommes infâmes” (Foucault, 1977), Moi, Pierre Rivière… (Foucault, 1973), Le désordre des familles (Farge & Foucault, 1982), all of these are ways to think these surprise and surprising words. Historians have sometimes taken the time to not necessarily hear the philosopher’s question, like perhaps they could not hear the call of yesterday’s words even though the work of Michel de Certeau—a contemporary of Foucault—was already published, e. g. La Fable mystique (de Certeau, 1982) and L’Ecriture de l’histoire (De Certeau, 1975). In 1992, a philosopher once again, Jacques Rancière, attempted to question the discipline of history. Indeed, Les Mots de l’histoire (later renamed Les Noms de l’histoire) examines the way history ‘inscribes’ and integrates, without adequate rigor, spoken words, the extravagance of those who speak, in a self-evident, homogeneous narrative and does not restore any roughness, any external or non-existent situations in which these words might have been spoken. His is a powerful book: “the age of history is that in which historians have invented a conceptual and narrative mechanism made to neutralize excess words” (Rancière, 1993, 88); Rancière may go largely unnoticed. It is obviously easier to describe, to inscribe than to undo, to deterritorialize, to displace, and to enable the unprecedented and unclassifiable event to be heard. 15And still, displacing does not render the narrative incomprehensible nor does it deconstruct it. It is possible to modify the course of historical thought in order to introduce the ordinary one composed of words and events. From the working hypothesis that words constitute an event, the focus can be moved to give them a status of truth, and not to mention them as simple anecdotes brightening up the entire historical narration. It is well known that the words cited or placed in between quotation marks are often those that color the narrative without reorienting it… What matters is something else if, like Michel Foucault, you are “haunted by the existence of discourse and by the fact that words happened; events functioned in relation to their initial situation, they have left traces, they survive and, in this very survival within history, they have some clear or secret functions” (Michel Foucault, 1967, 595). 16“Words happened”: they produce an event and conjure up new observable situations. When examining them as they play out, at the moment they occur, historians initially accept that they are dealing with a group of dispersed events. Heterogeneity becomes the norm, and then historians can make out forms of thought, differences or contradictions, which reinforce the reality of its differences and disjunctions. Then, it becomes possible at times to choose to turn these differences, or even this radical differentiation, into the foundation of a particular type of history, capable of taking up the challenges presented by apparent exceptionalism. Some historians—those who study the present—are confronted with the words of witnesses. They and the coherent historical discourse they are trying to build are faced with people who witnessed the past, who are still alive and often vibrant with memories and unanswered questions. Testimonies and historical objectivity then seem to contradict one another, while conflict—at times painful—between memory and history may occur. Memory, it is well known, is a personal theater and is created through intimate or mythical reconstitutions that may hamper historians (see Guillon & Laborie, 1995 and Rousso, 1995). Indeed, (and the debate rages on today) memory is not history; its irruption is often deemed cumbersome by the professionals of a history required to provide a coherent, well-ordered and truthful narrative. Witnesses, shouting out their words, seem to submerge the historian with too strong an outpouring of their feelings, by an overly sensitive and painful or even distorted memory that distracts or reorients the writing of the historical discourse. One can very well understand this; one needs only to look at the history of the Second World War, of the Vichy Regime, or of the Holocaust. Witnesses obviously have their own story to tell, they want it to be heard and, at times, historians may be faced with the subjectivity of those who lived the events, and may worry about these words, deemed too abundant to slip into the course of a well-ordered narrative. 17But is it not possible that the conflict between witness and narrative, between memory and history, is so uneven because history is not always capable of analyzing the words of others? Or at least, when dealing with words, has history not used as its main postulate territorializing them, flattening them, making them fit ‘normally’ within the realm of certified analyses and thus into certainty? Words in history all too easily serve the narrative as simple anecdotes and as a distraction away from the discourse, and they do not frequently become the main location from which historical questioning emerges. 18In a recent compilation of articles on the Resistance, Jean-Pierre Vernant (a specialist of ancient history and a former member of the Resistance himself) wrote: “When a witness [of the Resistance] says to a historian: ‘Your discourse does not make sense (I am completely lost…),’he is actually saying:’What about the human element?’”(Vernant, 1995, 344). Indeed, what do historians make of people: those who desire, love, suffer or contradict the straight line of clear analysis? This question, which is crucial for historians working on the present, likewise arises in the same way for all historians. The spoken word “places history outside of truth” (Rancière, 1993, 125), but how should such a history be written? It is not an easy task to discover words as they are being elaborated, to see them diverge from their traditional perspective and to turn these events into questions and challenges for the narration; for certain periods this process might provide a different dimension to history as a discipline. The witnesses, whether dead or alive, whether found in the archives or speaking out loud, are of course, in essence, the ones who speak too much or wrongly of another place: as historians, our work is to deal with excess, with dysfunction, to redevelop meanings, and to ‘think through’ the weight of words and the strange way they have of being between several places at once. 3 An attempt at doing this type of work can be found in Bourdieu, 1993. 19It is possible to state clearly and firmly the question of words and witnesses at a time when testimonies and personal stories are in fact the absolute stars of the media. The written press and television fight over the ‘best’ witnesses, those whose words are supposed to leave an indelible trace into the reader’s or the viewer’s heart. This overabundant display of the singular is undoubtedly comparable to the emptiness felt by everyone when faced with the coldness of analysis, whether political, journalistic, sociological, or even historical. And what will historians do in five or ten years when they have to work on the contemporary period and when the archives provide them with so much to read and see about so many homeless people, secondgeneration Arab immigrants ill-at-ease in their suburban neighborhoods, disoriented youths, workers on strike, and unemployed people? What narration will they develop about this ocean of testimonies that are more or less well chosen, singular, representative or exotic? First, they will have to analyze the scale of the social and political phenomena which led to the way in which these testimonies were found, gathered, organized and published.3 There lies unbound a whole part of reality waiting to be explored. But, then comes the next question: if so many willing witnesses were produced at the end of the twentieth century, was it not only because we were not able to translate the present into notes and analyses, but also because historians did not know how to deal with their task? In other words, to acknowledge that the words of others reroute the course of history while making it. Then comes the most difficult task of all: to turn these words into the extravagant matrix that is certain of our history. How will this be possible when, thus far, in their usual task of deciphering sources, historians have too rarely raised words to the status of possible events? 20Indeed, words from the eighteenth century or from the present mostly tell of very unusual incidents, of paths taken and then suddenly abandoned, of changed or aborted endeavors, of power that is confiscated, of ill-accepted defeats faced with triumphant memories, and of faltering victories. All of this, once reinvested with meaning and writing by historians—and in the way it comes about and is told—gives birth to what is going to happen and provides meaning to what is improvised before our very eyes. Through rediscovered bits of identity and words said between two places, between two evils, one can see history being made and improvised. Many examples can be found in contemporary testimonies, such as that of Khaled Kelkal, accused of a terrorist plot on the Paris-Lyons railroad line, arrested on September 29, 1995 in Vauqeray, and killed during a shootout. In October 1995, the daily Le Monde published an interview of this young man conducted long before his arrest, and during which he spoke about his living conditions and his relation with his siblings in his troubled neighborhood. Kelkal explained: “They talk about us only when there’s violence, so we become violent. It’s only a powder keg. It s only after riots that they start to understand. It’s not much, just to say, sort of “we’re here” (Le Monde, 1995). Through these rough words, repeated rapidly, with gaps, something heartbreaking, torn can be read, something that bores holes in both time and norm, while imposing onto history its horror, its mark, its rhythm, its crime projected onto others in the form of a plot, and its unavoidable violence. It is indeed possible to understand how much the event of words creates an event, how Kelkal’s sentence: “it’s not much, just to say, sort of ‘we’ re here’” is one in which the commotion, the insisting demand, and the denial of seriousness, depict one youth, but also other youths as they are tragically and cynically improvising their place in history, while admitting that they are echoing the lack of interest felt towards them by resorting to crime as a form of action. An irregular existence is created; one that is done and undone as words are being spoken. Quite simply, the official story of this young man’s life is nothing more then the announcement of a death after he was accused of terrorism; there exists a story beneath history that is part of this historical narration. 21We should be able to articulate initial irregularity, to scout out an event where we least expect it, to acknowledge that history takes place where everything goes by as if there were no history, so as “never to prevent present intensities of life and of its creations from taking place.” Is this a historian’s Utopian vision? Undoubtedly, but I remain certain that “words […] are more stubborn than facts” (Rancière, 1993, 195) and that historians depart from them when they are simply explained without being placed at the very moment of their utterance and without explaining what type of event that produces time and meaning they create. And why not believe that if historians had been more troubled by the words of days gone by, the present might not have this un-decidable and undecipherable face? 3. With Michel Foucault: Making Fun of Origins? 22The text written by Michel Foucault in 1971, entitled “Nietzsche, la généalogie, l’histoire”, is iconoclastic. The author “[mocks] the solemn aspects of origins” (Foucault, 1994c, 139) and opposes with vigor and mockery the search for the primeval orogon that explains all the phenomena that follow and where, in fact, only immobile forms are found in which we always happily believe in golden ages, in beginnings filled with perfection, bursting with serenity and beauty, those very ages that time would have henceforth perverted. For Foucault, this is an inaccurate and tragically erroneous vision. On the contrary, he asserts in this, intense, vehement and superbly written text that “we must maintain what happened in its distinctively scattered way” (Id., 141) and must acknowledge that “in fact, historical beginning is low, derisory, and ironical.” (Id., 149). 23This text is un-settling, because it shatters a portion of the presuppositions in any research and undoes many of the long-established bases of history. This essay brings commotion to reason when reason must break with the idea of necessary origin and shift to the initial paths of dispersal and breaking-up. 24Still, the statement that historical beginnings are “low, derisory, and ironical” is neither a philosophical invention nor the sardonic assertion of a particularly turbulent twentieth-century author, as well illustrated by legal archives of the eighteenth century and their long cohort of reports and interrogations. Indeed, event, derision and emptiness are formed through an infinite thickness of disorders, of resentments, but also of struggles and unremitting efforts, which eventually bring them to life. When Foucault writes: “Emergence is thus the arrival of forces […] it indicates a site of confrontation” (Id., 144)—something that usually happens—the incident, the unforeseeable, the serene or forceful leading of conflicts are exteriorized, and what is created emerges out of these improbable but real places, where words confront each other, knowledge and norms meet, constraints and transgressions are born. To reject the notion of an ideal origin does not mean to do away with family lines or genealogy. Foucault can thus write: “We are nothing more than what was said centuries, months, or weeks ago” (Foucault, 1994d, 116). While there seems to be a chain of words, it is neither linear nor smooth, but rather, it is defined more by breaking up and individuation, weaving a tragic and scattered structure of events and words, and the ways in which these events and words emerge can be recognized. A science, a discourse, a political or social mechanism, and the passage of time are then constructed out of these fragments of meaning that burst forth in an inopportune fashion. We must learn to recognize them and then express them. In 1951, Roland Barthes wrote: “History is a dream because it unites life and death without surprise or conviction” (Barthes, 1993). 25There is little dreaming in history’s long succession of narrated facts because historians are rarely surprised when faced with the heterogeneity of the subjects examined and of life’s excesses, and because they have only identified obvious regularity among collective phenomena, annotating, in order to integrate them better in their discourse, the words of people who said other things besides this regularity. Not only to make an event talk indeed, but to remain surprised by it; this is what historians should do when going through the simple task of collecting facts. 26And if one needs to feel reassured about the construction of a historical narrative that would necessitate being surprised anew and finding un-usual reading perspectives, one need only hear Michel Foucault’s words once again: “History has no meaning, which does not mean it is absurd or incoherent. On the contrary, it is intelligible and one should be able to analyze it in almost every detail, while taking into account the intelligibility of struggles, movements, strategies and tactics” (Foucault, 1994d, 145). BARTHES, Roland. 1993 . Michelet. L’Histoire et la Mort In Œuvres complètes, Vol. I, 1942-1965. Paris: Editions du Seuil. BOURDIEU, Pierre. 1993. La Misère du Monde. Paris: Editions du Seuil, 1993. [1999. The Weight of the World : Social Suffering in Contemporary Society. Cambridge, UK: Polity Press]. DE CERTEAU, Michel. L’Écriture de l’histoire. Paris: Gallimard. [1992. Tom Clancey, translator. The Writing of History. New York: Columbia University Press]. ——— 1982. La Fable mystique, XVIè-XVIIè siècles. Paris: Gallimard. [1995. The Mystic Fable. The 16th and 17th centuries (Religion and Postmodernism Series). Chicago: University of Chicago Press]. FARGE, Ariette & Michel FOUCAULT. 1982. Le Désordre des familles. Lettres de cachet des Archives de la Bastille. Paris: Gallimard (Collection «Archives»). FOUCAULT, Michel. 1973. Moi, Pierre Rivière, ayant égorgé ma mère, ma soeur et mon frère… Paris: Gallimard. [1982 (Reprint). Pierre Rivière, Having Slaughtered my Mother, my Sister, my Brother… A Case of Parricide in the 19th Century. Lincoln, Nebraska: University of Nebraska Press]. ——— 1976. L’Histoire de la folie à l’Âge Classique. Paris: Gallimard. [1988. Madness and Civilization. A History of Insanity in the Age of Reason. New York: Vintage]. ——— 1994a , Dits et Ecrits. Vol. I, « Les mots qui saignent». Paris: Gallimard. ——— 1994b , Dits et Ecrits. Vol. I, « Sur les façons d’écrire l’histoire». Paris: Gallimard. ——— 1994c , Dits et Ecrits. Vol. II, « Nietzsche, la généalogie, l’histoire. » Paris: Gallimard. ——— 1994d , Dits et Ecrits. Vol. III. Paris: Gallimard. GUILLON, Jean-Marie & Pierre Laborie. Ed. 1995. Mémoire et Histoire: La Résistance. Toulouse: Privat. LE MONDE. 1995. « Moi Khaled Kelkal. », October 7, 1995. RANCIÈRE, Jacques. 1993. Les Noms de l’histoire. Essai de poétique du savoir. Paris: Editions du Seuil. [1994. The Names of History. On the Politics of Knowledge. Minneapolis, Minnesota: University of Minnesota Press]. RETAT, Pierre. 1995. Le Dernier Règne. Chronique de la France de Louis XVI, 1774-1789. Paris: Fayard. REVEL, Jacques. 1989. « L’histoire au ras du sol In Giovanni Levi, Le Pouvoir au village, histoire d’un exorciste dans le Piémont du XXVIIè siècle » Paris: Gallimard, collection « Bibliothèque des Histoires », i-xxxiii. ROUSSO, Henry. 1995. « L’archive ou la quête du manque. », In Actualité et patrimoine écrit. Actes du colloque, Roanne, septembre 1995 & FFCB Bibliothèque municipale de Roanne, 92-98. VERNANT, Jean-Pierre. 1995. 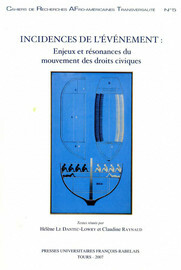 « La mémoire des historiens », In Guillon & Laborie Ed. 1995. 1 This essay was translated from a chapter of Ariette Farge’s book entitled Des lieux pour l’histoire (Paris: Editions du Seuil, 1997.82-96). We thank Ariette Farge and Editions du Seuil for allowing us to include our translation in this volume. Her work has served as the theoretical framework for our analysis of an event in history (see Introduction). 2 Whenever an English-language version of a book or article is available, its title has been provided in the list of works cited at the end of this essay. Directrice de recherche au CNRS (Centre de Recherches Historiques), historienne du XVIII siècle, elle étudie les comportements populaires (foule, opinion publique, famille, sensibilités) à partir des archives de police. Elle travaille sur les relations entre hommes et femmes et s’intéresse à l’image, la photographie et l’écriture de l’histoire. Elle a publié un grand nombre d’articles, essais et ouvrages dont notamment : Des lieux pour l’histoire (Seuil, 1997), Les Bracelets de parchemin (2003), Quel bruit ferons-nous ? (avec J. C. Marti, Les Prairies ordinaires, 2005) et La Part du corps (Odile Jacob, 2007). Professor at the CNRS, Ariette Farge specializes in the 18th century and studies popular behavior (crowds, public opinion, the family) using police archives. She also studies relations between men and women and is interested in images, photography, and the writing of history. She has published numerous articles, essays and books, including: Des lieux pour l’histoire (Seuil, 1997), Les Bracelets de parchemin (2003), Quel bruit ferons-nous ? (with J. C. Marti, Les Prairies ordinaires, 2005) et La Part du corps (Odile Jacob, 2007). FARGE, Arlette. Of the Event In : Incidences de l'événement : Enjeux et résonances du mouvement des droits civiques [en ligne]. Tours : Presses universitaires François-Rabelais, 2007 (généré le 21 avril 2019). Disponible sur Internet : <http://books.openedition.org/pufr/5506>. ISBN : 9782869064423. DOI : 10.4000/books.pufr.5506. Farge, Arlette. “Of the Event”. Le Dantec-Lowry, Hélène, et Claudine Raynaud. Incidences de l'événement : Enjeux et résonances du mouvement des droits civiques. Tours : Presses universitaires François-Rabelais, 2007. (pp. 29-41) Web. <http://books.openedition.org/pufr/5506>. LE DANTEC-LOWRY, Hélène (dir.) ; RAYNAUD, Claudine (dir.). Incidences de l'événement : Enjeux et résonances du mouvement des droits civiques. Nouvelle édition [en ligne]. Tours : Presses universitaires François-Rabelais, 2007 (généré le 21 avril 2019). Disponible sur Internet : <http://books.openedition.org/pufr/5498>. ISBN : 9782869064423. DOI : 10.4000/books.pufr.5498.